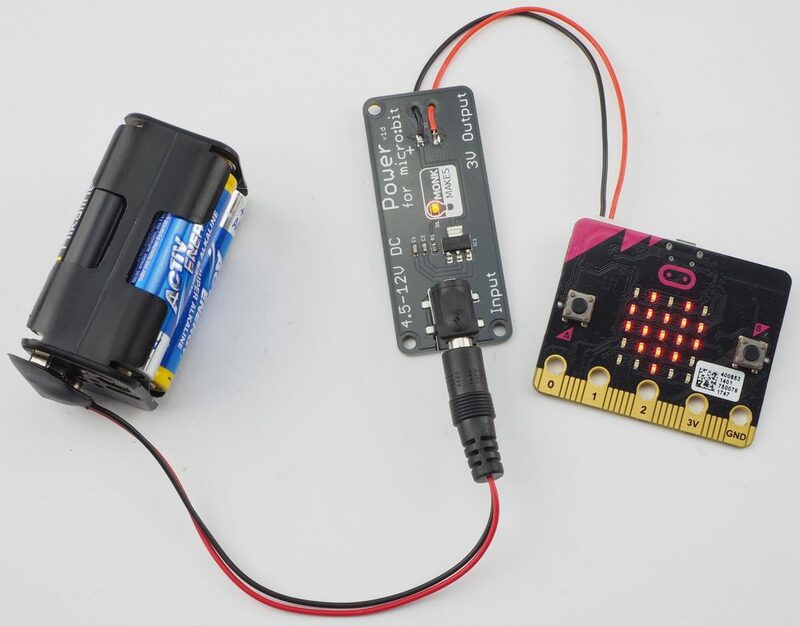 The MonkMakes Power for micro:bit opens up lots of ways of powering your micro:bit. This tiny board has a standard DC barrel jack socket at one end and provides a regulated 3.3V output that you can use to power your micro:bit using the JST battery connector attached to wires coming from the other end of the board. 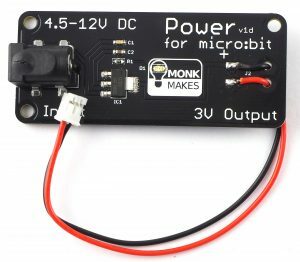 You might want to use a MonkMakes Power for micro:bit board if you want to use a AC to DC adapter, solar panels, or other sources of power that are not the 3V or so that the micro:bit is expecting. The Power for micro:bit will accept an input voltage of 4.5 to 12V DC from its standard DC barrel jack socket and convert it into a pleasantly regulated 3.3V for your micro:bit. 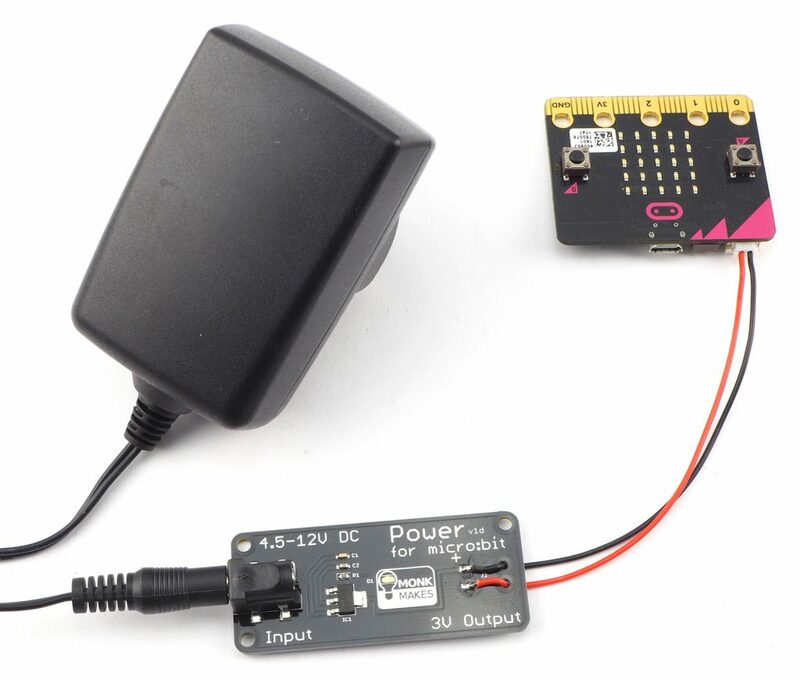 The advantages of using a Power for micro:bit instead of say a USB 5V power supply are firstly that some USB 5V adaptors can cause problems with the micro:bit (see micro:bit’s safety guidelines) and secondly because the micro:bit’s battery connector is connected directly to the 3V alligator clip-able connector of the micro:bit, you can supply other things that are connected to the micro:bit with a lot more than the allowed 90mA. In fact you can supply up to 700mA. This makes the board great for use with things like NeoPixel strips or servomotors that need a bit more current. If you need to power your micro:bit project for long periods of time, then you are going to get sick of changing the batteries all the time. By using an AC adapter (not included, but 6V recommended) you can power your micro:bit indefinitely. When powered from USB power, your micro:bit can only supply a maximum of 90mA of current through its 3V connector. 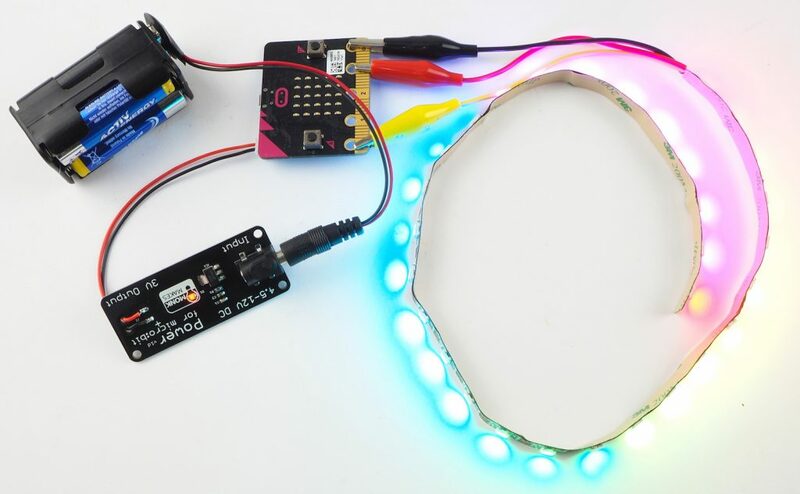 This means that powering Neopixel LED displays or servomotors that need more current, may not work, or be reliable. The MonkMakes Power for micro:bit boosts this maximum output current to a much more respectable 700mA. Enough to power far more Neopixels (the exact number depends on LED brightness) but // todo – verify max number at full brightness//. The standard AAA battery pack works well, but will only last for a few days of continuous use of the micro:bit. By using the Power for micro:bit with a bigger battery pack with a DC barrel jack (you can achieve much greater battery life). For example, using a 4 x AA battery pack should provide roughly 4 times the battery life that you would expect from a AAA battery pack. Input connector: 2.1mm DC barrel jack connector positive center connector.